Rife with classical allusions and inherited forms, this volume recollects a lost love and asks the eternal “What if …?” Often the allusions create distance between the writer and the material, such that those details which add verisimilitude and connection for the reader are lost amidst the elevated language or the characters of Greek mythology. Murray, an emeritus professor of psychology, is the author of four other books of poetry as well as scholarly books, articles and encyclopedia entries. Perhaps it is his academic background that influenced the book, as it has a rich, latinate vocabulary that sometimes distracts from the poems themselves. The author introduces the book with a foreword explaining the primary narrative—a series of failed romances, followed by a more successful romance that nonetheless ended. Murray then offers two primary ideas for readers to embrace while engaging the volume. Rather than an introduction of this sort, a stronger narrative pulse in the poems themselves would have given readers a more immersed experience. The first section, Nightmares and Backscreams, presents a speaker/poet who suffers at the hands of various women, one in particular. Often, the self-pity of the speaker takes over the poem, lessening the impact of any wisdom. Nevertheless, Murray does have a wonderful moment of self-awareness when he writes in “Nightmare #3” of wanting a woman as custom-made for him as his beloved and deceased wife, Esther. But he comes to the realization that he cannot simply replicate that experience: “To have no newness, just a repetition/Is the last thing that I could tolerate or want.” He possesses a good ear for sound and rhythm, as “Back-Scream #13” illustrates: “To diapase your breasts with life/ And clothe with skeins your silken form,/ The night itself would wield a knife/ To cut the daylight from the morn.” The classical allusion is subtle enough without interfering with a layperson’s understanding of the poem, while still enriching the piece with Spenser’s influence for those in the know. This balance works. 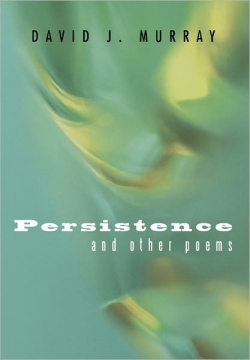 In the second section, Persistence, the poems reflect on a more positive relationship where the figure of the woman is revered and her memory persists, a quality Murray calls her “persistingness.” The poet creates a number of words throughout the volume, where an image, deftly done, might have better captured the elusive quality he sought to explain. Making fresher use of the classical allusions, as Louise Gluck does to great success, might be a consideration for Murray’s next volume. Here they weigh the volume down and sap it of any contemporaneous feeling. Still, at his best, Murray’s ear for sound and his use of apt allusions make for poems that are a pleasure to read aloud.